These roofs are leading the way in conservatory and orangery design, giving you the ultimate and unrivalled view from your home and extension with supreme aerial views. This combined with its industry-leading thermal performance ensures you can use your conservatory/orangery 365 days a year. 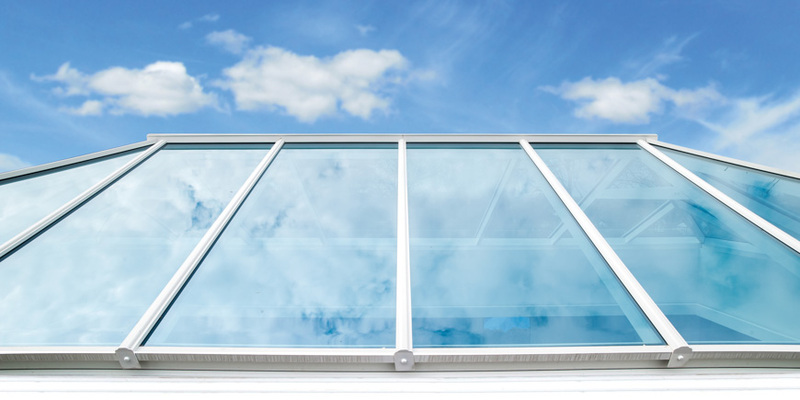 Whether you’re inside looking up, or outside looking enviously in, the roof puts any property in a class of its own. No clunky bars or supports cluttering the ridge. No thick, chunky profiles dominating the glazing. The unique system design is pure engineering magic. Super strong, light, 40mm aluminium box rafters create slim, elegant roof profiles with excellent thermal performance. Compared to conventional roofs sold by competitors, We slashed the visible width and sightlines of rafters by 30% and the main feature ridge by 70%. MORE SKY LESS ROOF™ Slimmer 60% Slimmer internal ridge than alternatives 38% slimmer internal hip than alternatives Over 50% lower external bulk Stronger Tested wind pressure of up to 1.32 KNm2 Structural ringbeam supplied with the lantern roof kits does not rely on t..